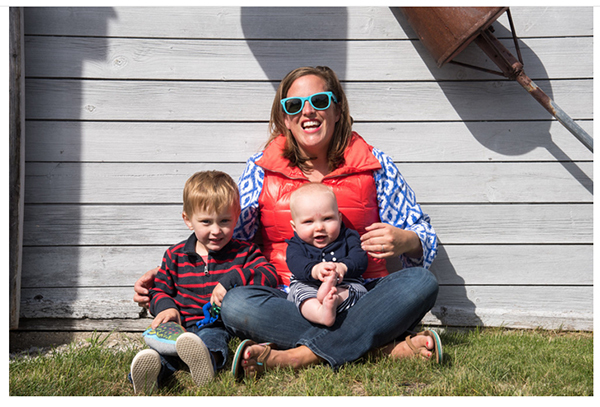 We’re thrilled to introduce our latest featured maker, Maggie Revel Mielczarek of Leland gal. 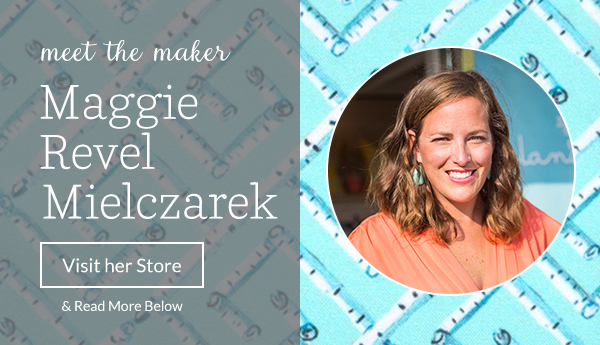 Maggie splits time between Grand Rapids, Michigan, and Leland, Michigan, where her seasonal shop draws customers with colorful, unique prints inspired by waterside living. Buoyed by her background in art education, she taught herself graphic design and turned her eye for color into textile printmaking with Spoonflower. It’s no surprise that both her grandmother (pictured below at 103 years old!) and mother are artists and have passed on their talents and encouragement to Maggie. Follow her Instagram to stay up-to-date with her latest creations. My day starts with a bit of a mom hustle, feeding two boys, getting one to school and the other back down for a nap and then hit the ground running with either a shift at the store, exercise, or checking things off my list. 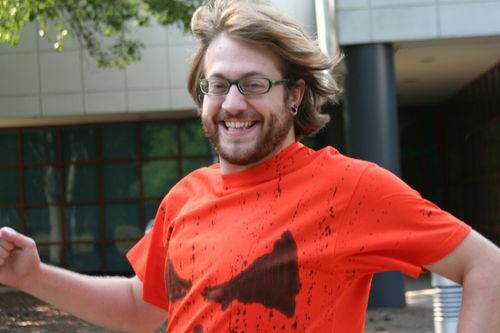 Seen above in one of his own unique, hand-inked t-shirts, Chad Graves is a coder extraordinaire here at Spoonflower. As our second non-family employee hired about 6 months after Danielle, he’s been here longer than most anyone. Chad comes from a family of folks who have worked in the fabric industry, and he now spends his days at Spoonflower producing spiffy new changes to our profile and shop pages among other things. You can read more about him below–enjoy! 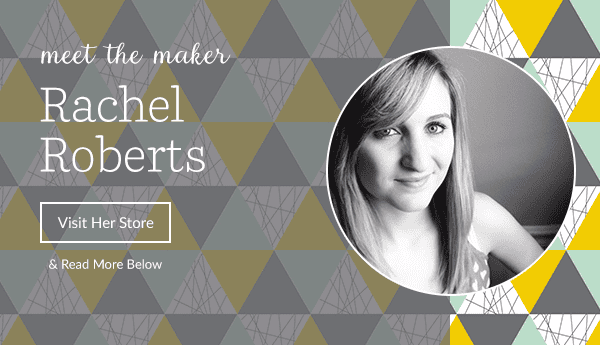 You’re one of the people who’s been with Spoonflower since almost the beginning. How do you think things have changed since those early days? The thing that really stands out to me since starting here is how the pace of things has changed. It’s hard to imagine that just two years ago we got a new batch of three printers and thought the sky was the limit! We barely filled the new building we were in. Now we have 12 printers and print more in one day then we did in an average week. We have 4 or 5 times as many employees. We are already pushing the seams of the building we moved into just a year ago. The scale at which we’ve grown has been nothing but impressive. One of the things that has not changed since I’ve been at Spoonflower is the sense of community that we share here and with our customers. Everyone, good day or bad, enjoys what they do. It’s apparent as soon as you walk in the door. The best change though, hands down, has been getting air-conditioning. It was so hot back in Mebane. What was a typical work day like for you back then? How about now? Back when the business was still getting its legs, everyone did a little of everything. I was hired to help develop the website but I was quickly enlisted to print, take out the trash, run to the store for soda, take the mail, sweep the floor, and cut/pack the fabric, change light bulbs, etc. As we’ve grown that’s never really changed, but within the last 6 months with all the new people we’ve brought in, I finally have been able to focus on coding. I now spend my days trying to wrangle down bugs, create fancy new things, and make our website everything it wants to be. I miss the old days of always having a hand in most projects, but we’ve grown so much that it takes a team to do each of the many things I used to do every day. What sort of education and work experience did you have before coming to Spoonflower? What made you want to work here? I graduated from the University of North Carolina at Greensboro with a BFA in Graphic Design with a minor in Computer Science. I actually graduated in the same class as Danielle, back in 2008. My family has been involved in the fabric industry basically my whole life. My dad has been a fabric sales rep since my early childhood and is currently VP of a company based out of New Jersey that prints fabric in China. My uncle has a furniture business based in Hight Point, NC. His company was the one that produced the chair that we showcased a while back with all the pretty colors. Personally, I spent about 3 years working in a fabric warehouse in High Point. Ironically, I didn’t want to spend my life working in fabric but when I discovered Spoonflower, I knew that I had to jump at the chance. The idea of working for a small start-up with such a grand ambition as redefining the fabric industry–and bringing it back to North Carolina–was something that I couldn’t pass up. Is there anything that you’re really happy about having learned here? The one thing that I absolutely love about Spoonflower is that I learn something new almost every single day. To pinpoint one thing, though, I’d have to say the skills that I’ve learned while coding are things that I could never have gotten from any class or school. Having a great teacher like Gart has been something that has defined my experience here at Spoonflower. Without his guidance I couldn’t have been half the programmer I am now. What’s your favorite way to get creative in your spare time? One of the hardest things for me since leaving school is finding the time to really get super creative. Most of my time here at Spoonflower has been long weeks and odd hours. I’ve spent many nights crashing on the couch, working 3rd shift, etc. That being said, I’ve been focusing on creating t-shirts lately. I spend a lot of time cleaning our printers and started to experiment with using our waste ink on different materials which led me to creating shirts. I like the idea of making my own clothes and wearing something that no one else could possibly have. I create each shirt by hand rather than with a screen, so each is totally unique. Recently, I created an Etsy shop under the name of PressInk to try and find a home for all of my creations. Do you have a favorite design or designer on the site? I have to say Holli_Zollinger is probably one of my favorite designers. I love the simplicity of most of her designs. The “fabric weave” appearance she creates behind her designs really accentuates the look and feel of them. I can always tell one of her prints from others, and to be able to say that given the thousands of yards of fabric I’ve printed says a lot to me. Keep up the great work, Holli! If you could add anything at all to the site–even it’s not actually possible from an engineering standpoint–what feature would you add to Spoonflower? The one thing I’d really like to add is a tool to allow people to create designs on the site. I know Photoshop will always be more powerful, but who really has that kind of money to blow on a hobby or single project outside of the professionals? The idea of putting creative control into the hands of the masses really appeals to me. Most of the changes we’ve made to the site in the last year are trying to give that to our community, and I don’t want to stop. Shifting gears a little bit here, um, what’s up with the not-wearing-shoes thing? So my true calling is a music-loving hippie. If I could sit in a field and listen to someone jam all day, I would be at complete peace. The first summer that I started at Spoonflower, I had really started to embrace that part of me. Since we are all one big family here, that was totally accepted and I’ve walked shoeless ever since. I am proud to say since then I’ve acquired a few followers. Complete this sentence: If I could only _____________ at Spoonflower, ___________ would be much _______________. If I could only code faster at Spoonflower, our Flickr forum would be much happier. Is there anything else you want Spoonflower readers to know about you? Our community is full of some of the most creative people I’ve ever had the privilege to know. I know I haven’t met many of you, but I’ve seen and heard a lot of stories through the designs I’ve printed and conversations I’ve had via phone and e-mail. Each day has been a joy because I get to see new art and so many wonderful ideas. This alone is enough to keep me working, to make things better, and want to see us keep growing. Keep up the great work everyone, because it drives all of us here to work hard for you!